In the beginning of May the 2nd open Belarusian Powerlifting Federation Championship took place in Grodno, Belarus. 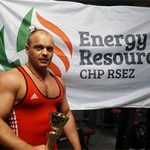 In a fierce battle Edgars Ratnieks, the operator of the cogeneration station “Energy Resources CHP” RSEZ SIA won the 2nd place in a discipline bench press and set up his personal record – 210 kilos thus running rules of the master of sports. In June Edgars participated in Latvian Chapionship of bench press in Daugavpils and took the 1st place on a pedestal in a weight category 105 kilos. We are proud of Edgar’s achievements and wish him success in future!